By Chris Williams:Conor McGregor does not view middleweight champion Gennady “GGG” Golovkin and Saul Canelo Alvarez as fighters that he sees at the top of the sport. McGregor is lot more impressed with the fighters in the lighter weight classes. McGregor specifically likes super bantamweight champion Guillermo Rigondeaux and super featherweight belt holder Vasyl Lomachenko. McGregor wishes that they would face each other, as he wants to see who the better fighter is of the two. As for Canelo and Golovkin, McGregor views them as flawed fighters. He says Canelo is too flat-footed and easy to hit. He doesn’t have the mobility that McGregor would like to see. After watching Canelo take jabs to the face in looking at some of his past fights, he didn’t like what he saw. With Golovkin, McGregor says he thinks he came into his recent training camp for the Canelo fight BADLY out of shape. McGregor says he sees a drained fighter in Golovkin. “I like Rigondeaux. I’m a big fan of Rigondeaux,” said McGregor to the boxing media. “I like Lomachenlo as well. I think those two should come and compete. I don’t understand why Lomachenko isn’t engaging in it all. There hasn’t been one mention of his name. In his last fight, he was good. He had some glimpses of what he does. His energy wasn’t right. It was like he didn’t even want to be there. That fight needs to happen,” said McGregor about Lomachenko vs. Rigondeaux. Lomachenko seems to be risk aversive. He took some big risks earlier in his pro career when he fought Orlando Salido and Gary Russell Jr., but he’s not much since then. Lomachenko is nearing 30, and he’s now taking it easy with his career, not facing the guys that could potentially beat him like Mikey Garcia, and Rigondeaux. Instead, we’re seeing Lomachenko play it safe fighting the likes of Miguel Marriaga, Jason Sosa, Nicholas Walters and Roman Martinez. Lomachenko’s career is getting used up and he’s not getting a lot of mileage out of it. Whether that’s his fault or his promoters at Top Rank is unclear. Whatever the case, Lomachenko needs to decide whether he wants to be popular or just another unknown champion in the lower weight classes. He’s not going to get more popular beating the guys he’s been beating. No one cares that Lomachenko can beat Marriaga, Martinez, Sosa and Walters. They want to see Lomachenko step it up against Rigondeaux and Mikey. I smell fear. I personally think Lomachenko is afraid of them. Oh well, he can stay at super featherweight and milk his WBO title for the remainder of his career against the obscure fighters in that weight class. Mikey would probably beat him anyway; the same with Rigondeaux. Lomachenko knows his limitations. “Boxing is a crazy game. There’s so much at play in the boxing game,” said McGregor. “It’s a great game. Who else in today’s game? Canelo and Golovkin; I’m not too much of a fan of either of those. I think Canelo is a little bit stuck, a little bit flat on his feet. When I was watching footage of him, I just see him getting peppered. He has no feet under him. Golovkin came into camp for this preparation badly out of shape. In looking at him badly out of shape at Big Bear, and I just see drained individual. Although they’re supposed to be up there as well, I don’t believe they really are. I like the lighter guys. Lomachenko and Rigondeaux is a fight I really want to see,” said McGregor. I think Golovkin has some ability, but he’s getting too big in between fights and he looks weight drained when he makes weight. For this current camp, Golovkin looks like he started training camp in the 190s. He’s been working out steadily for his September 16 fight against Canelo, but he still looks as big as a house. The World Boxing Council mandated 30-day weight day weigh-in is this week for the Canelo-Golovkin fight, and I wouldn’t be surprised if the 35-year-old Golovkin is 185 lbs. That’s my prediction. I see GGG at 185 lbs. with 30 days to try and get down to 160 lbs. for the September 15 weigh-in. Golovkin will likely drop the weight to get down to 175 and then dehydrate to make 160, but I don’t think he’s going to be strong after he rehydrates for the fight. I used to think Golovkin would beat Canelo, but not anymore. Golovkin is too big now, and he’s going to lose due to the weight on fight night. He’ll be weak and weight drained, and Canelo will win the fight by default just like he did against Julio Cesar Chavez Jr. on May 6. Chavez Jr. looked ill from losing so much weight in training camp. 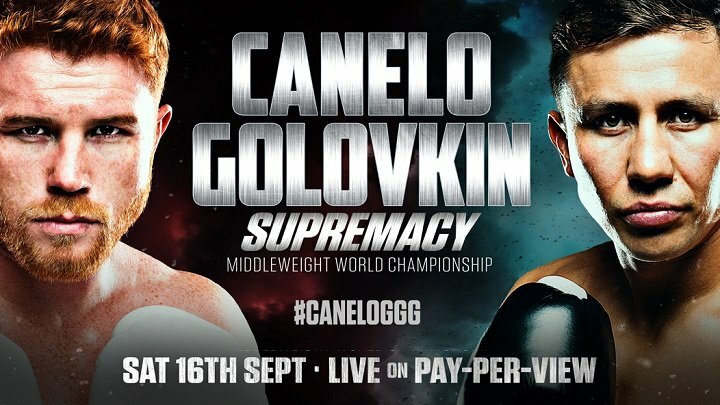 Canelo is not going to be the star of the middleweight division even if he beats Golovkin. I think Golden Boy Promotions are going to be careful in who they match Canelo with. They’ll probably put together a rematch with Golovkin, because once they’ve beaten him the first time, they’ll figure they can do it again. But after that fight, which I think Canelo will win; Golden Boy will keep him away from the real talents in the middleweight division in Jermall Charlo and Danny Jacobs. Those fighters are too dangerous for Canelo in my opinion. Those guys are the immediate future for the 160lb division. Even if Golden Boy matches Canelo against David Lemieux, I think he’ll lose to him. Lemieux can really punch and he’s flat out dangerous. Golden Boy would be making a mistake in putting Canelo in with Lemieux right now. They would do well to age Lemieux by making him wait for the Canelo fight. Lemieux is having problems getting down to the 160lb division right now. If Golden Boy waits 2 more years, I doubt Lemieux will be able to make the weight limit for the middleweight division without being depleted like we saw with Chavez Jr. in the Canelo fight. Lemieux will be dead at the weight in making 160, and then Canelo can safely fight him with worrying about getting beaten. I think McGregor would be knocked out easily by Canelo and Golovkin. He can be critical of them all he wants, but he would be destroyed if he ever fought either of them. It would be too easy for Canelo and GGG. McGregor is going to get schooled by Floyd Mayweather Jr. on August 26 in thier fight on Showtime PPV at the T-Mobile Arena in Las Vegas, Nevada. That’s the fight that McGregor should be focusing on right now instead of giving his opinion on other fights and fighters. He’s got his own problems to worry about in Mayweather.